As Andy Williams says, “It's the most wonderful time of the year!” No, I'm not talking about Christmas. I'm talking about College Football season!!! It is finally here! To put it simply, football is a way of life here in Alabama. It is all we talk about all year round. Most people are talking about the recruits, practice, starting positions. I am talking about the food! These Pulled Pork Nachos are the perfect snack for watching all the games this weekend. They don’t take a lot of time to make and they taste fantastic! I suggest cooking the pork the day before you make nachos and storing it in the refrigerator until you are ready to assemble the nachos. Plan on making several batches of these – they went fast at our house! In a medium saucepan, reheat the pork with the BBQ sauce. Preheat oven to 500 degrees. Line a baking sheet with foil. Place tortilla chips in a single layer on baking sheet. Using tongs, spread the saucy meat around the tortilla chips. Squeeze out sour cream in a crisscross pattern over chips and meat (I used a sandwich bag and cut the tip off the edge of the bag). Then spread the cheese over the chips evenly to the rim. Top with jalapeno slices and diced tomatoes. Toast in 500-degree oven until cheese is melted completely (should toast quickly). Transfer nachos to a serving platter. That's the song I'm singing, too...it's finally here! Looking forward to your great tailgating recipes this fall! Nachos are so easy and so delicious. Really like your version. I made pulled pork sandwiches the other night and have a little bit left in the freezer, but not enough for another round of sandwiches. Now I know what to do with it! Thank you! They look super good Steph and I like several things you did - single layer so all chips are covered, lots of topping, real cheese vs the sauce stuff. I could go for a plate of them for breakfast this am. Da Crimson Tide is NACHO Champions !! Happy holiday. Am out next week. Will catch up asap. 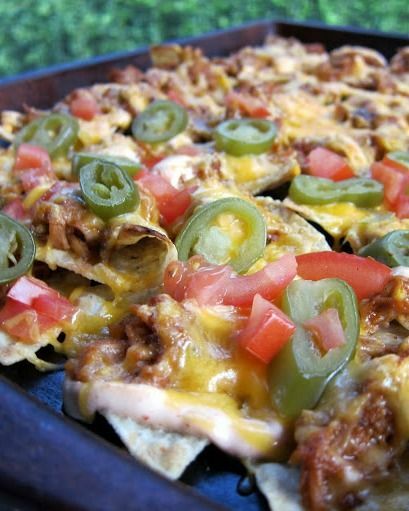 I'm making a big pot of chili for the games on Saturday, but next weekend I am making these nachos - they look great! Larry - I could eat these for breakfast too! I notice you only put jalapenos on half to appease the light weights, ha ha. Love bbq nachos! Think I'll make some bbq chix nachos on Saturday. So glad to have you linked up on the Football Friday bloghop! The nachos look SO GOOD. And most importantly, War Eagle! I love that song and think the same thing about fall - actually college football is the only part of fall I like :) these nachos seriously look too good to eat and I'm definitely making them for a future Penn State game day!